CHICAGO – I’m not sure if Gene Roddenberry ever read Antoine de Saint-Exupéry’s 1943 French novella, but even before “Star Trek” first aired in 1966, kids everywhere since 1943 recall one of the first space explorers to voyage where no boy has gone before: “The Little Prince”. So when Chicago’s Lookingglass Theatre Company (co-founded by David Schwimmer of “Friends” fame) decided to bring it to life on stage, it gave me the opportunity to bring an imaginative 9-year-old book lover to see it after I recently read to her the pop-up version of the story. 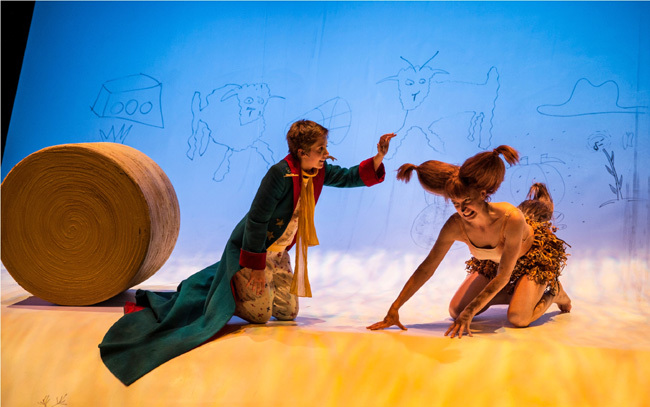 Amelia Hefferon (left, The Little Prince) and Kasey Foster (Fox) in the Lookingglass Theatre’s “The Little Prince”. “The Little Prince” (which my mom read to me as a kid) still sits in my pile of favorite boyhood books. As an adult, what I didn’t remember about it is its adult-like vocabulary. Despite this 9-year-old having a teenage vocabulary already and advanced reading comprehension, I still needed to explain quite a bit to her about what was going on and what certain words meant. Lauren Hirte in the Lookingglass Theatre’s “The Little Prince”. But not so with the Lookingglass Theatre’s adaptation. Bursting with life and pure imagination, the Lookingglass has brought to bat everything visual and audible any child or adult would need to understand and fall in love with this beloved story. There are tricks around every turn and you’re always wondering what’ll come next. For 90 minutes without intermission, though, you do feel as though the play is a bit long, can drag at times and could have been culled down slightly in editing. The show has already been extended by 3 weeks through Feb. 23, 2014 due to advance ticket demand. “The Little Prince” runs at Lookingglass Theatre Company inside Chicago’s historic Water Tower Water Works at 821 N. Michigan Ave. The press opening last night saw a full house, but interestingly, fewer seats are available in this theatre than there normally are. Produced in association with The Actors Gymnasium by Rick Cummins and John Scoullar and directed by David Catlin (creator of “Lookingglass Alice”), the Lookingglass expanded the stage to make use of more of the room – even within and above where audience members sit. 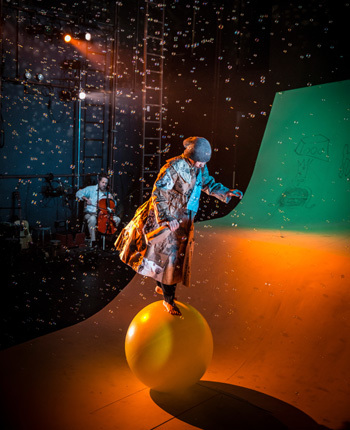 This stage envisioning of “The Little Prince” feels Willy Wonka-esque with its imaginative amalgamation of live theatre with modern dance, acrobatics, live music, extensive prop work, wacky costumes, bubbles that don’t pop and even Foley artists. Many of these multi-talented actors can also sing, dance, suspend from the ceiling and even tackle the live creation of everyday sounds. Casting was deftly done and clearly was a challenge. Kareem Bandealy (center) Amelia Hefferon (right, The Little Prince) in the Lookingglass Theatre’s “The Little Prince”. Stuck, thirsty and alone, an aviator stranded in Earth’s Sahara Desert meets an enigmatic and charismatic young prince who fell from the sky. This little prince regales him with tales of life among the stars. 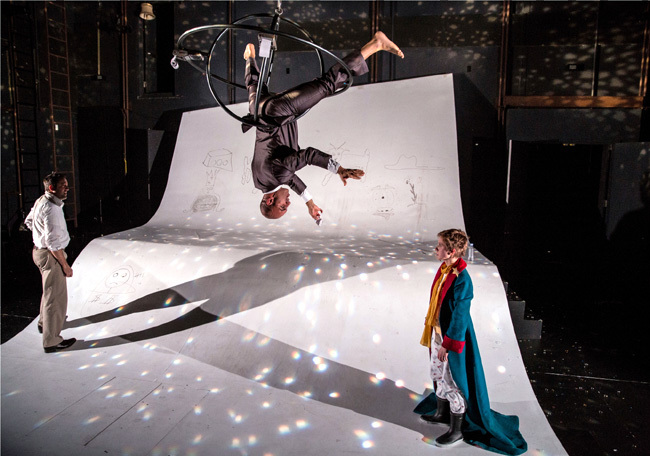 The Lookingglass has created a visually arresting and fully immersive theatrical interpretation with funny and memorable characters who bring this story to life using physical feats, spot-on lighting and all of the sights and sounds you couldn’t imagine. Even the stage has holes in it with baobab trees that need to be weeded away by our prince. He comes from his own teeny tiny planet and only knows them, a single rose he learns to call a friend and a few volcanoes that need cleaning. As our little prince travels through strange new worlds and meets new characters across many planets, he learns about love and friendship. He sees that loneliness he used to feel on his little planet is actually full of all the joy and comfort he needs. Speaking to the castaway in all of us, the show challenges our perspective, opens our eyes and importantly brings us back to the heart of what truly matters. 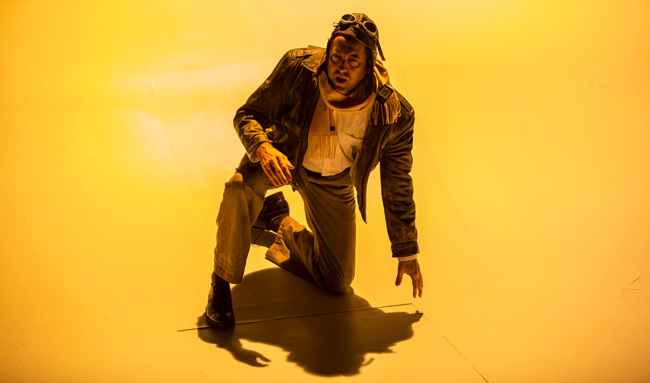 Ian Barford (Aviator) in the Lookingglass Theatre’s “The Little Prince”. Is the businessman’s business truly as important as he thinks or is he missing out on life right before his eyes? Does the vain man really need all the adoration he seeks or can he simply be happy with who he is? Most importantly, is our aviator’s very important business of fixing his downed plane so urgent or his new friendship with our little prince much more so? Just as our aviator questions himself for becoming a blind grown-up and the little prince reminds him of what’s truly important, perhaps the fox offers us the best lesson of all about what it means to have a friend. By spending time to be “tamed” and uniquely bonded to each other as friends, so does the little prince’s common rose become unique to him in all of the galaxy. ”The Little Prince” runs Tuesday through Sunday at the Lookingglass Theatre Company inside Chicago’s Water Tower Water Works at 821 N. Michigan Ave. at Pearson. Tickets are $45 to $75 and are available here. This production is appropriate for children 5 and older. The cast includes ensemble member Raymond Fox (King) with Lauren Hirte (Desert Rose), Louise Lamson (Rose), Ian Barford (Aviator), Amelia Hefferon (The Little Prince), Kareem Bandealy (Snake), Adeoye (Lamp Lighter) and Kasey Foster (Fox). The play is directed by David Catlin.